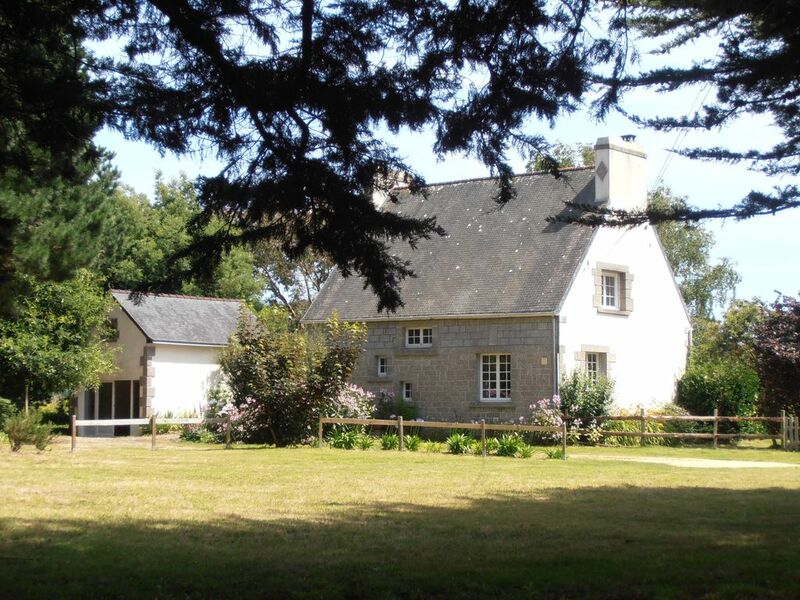 it is a detached house of 170 m2 for 8 people to 12 people (option) located in Bigouden Country. Quite quiet, on 4000 m2 of land (1000 m2 of landscaped garden, 1000 m2 of land of relaxation, 2000 m2 of pre), without neighbors nor opposite, feeling 'holiday' is immediate. A nice hiking trail, you can reach with the stroller possibly, dunes, beach and the ocean is 400 m (1 km by road). The first garden closed and flowered offer you the shadow of its great birches, a large terrace for dining. The second garden will allow you to group activities, badminton, petanque etc. Surroundings, many sites to visit, organized cultural events, various activities. Option "dependency": sofa bed for 2 people on the ground floor, bed 2 people upstairs, wc; 300 euro the week charges included. The bathroom is upstairs, facing south, often bright and we see the ocean. The bathroom is on the ground floor and has 1 toilet, 1 sink and 1 shower. A second toilet is available in the dependence on the outside. In the garden, the Chilean encourage idleness, fresh herbs in the kitchen, a barbecue cooking fish or prawns, and large wooden table to enjoy family and friends. In the house, the dishes are planned in number, arranged in the room and in the kitchen to cover local needs, you will find in the cupboards of indoor and outdoor games, DVD, books ... The house is 'alive' and is enriched over the years of the passage of his conquered vacationers. You may also leave them a souvenir of your visit, shells, soft toys bouquets!